"I am the true vine, ... I am the vine, you are the branches; he who abides in Me and I in him, he bears much fruit, for apart from Me you can do nothing". These are the opening words of John 15, a chapter that is very likely familiar to most Christians. It speaks of Jesus as the vine, and our Father as the vinedresser; of branches -- both those that bear fruit, and those who don't. It presents the image of pruned branches that grow to produce more fruit, and branches that dry up and are cast into the fire where they are burned. And throughout it all, Jesus talks about abiding ... He in the Father; us in Him, and He in us. Yes, we are familiar with this Chapter, but do we know what He was really saying, and why He picked this particular imagery? First of all, I wonder how many discern that this metaphor of the vine, vinedresser, and branches is part of the discussion Jesus has with His disciples during His last Passover supper? And that ultimately, He is disclosing to them the desired relationship of Believers to Himself and the Father? When I researched the attributes and the actions of a Vinedresser, it began to be clearer to me why He used these symbols. A vinedresser is more than a mere farmer. Grapes are more than an annual crop. The vinedresser's grape vines remain with him for decades. He comes to know each one in a personal way, much like a shepherd with his sheep. He knows how the vine is faring from year to year and which ones are more productive or vigorous than others. He knows what they respond to and what special care certain one's need. Every vine has its own personality. And the vinedresser comes to know it over the years. The vinedresser cares for each vine and nurtures it, pruning it the appropriate amount at the appropriate times, fertilizing it, lifting its branches from the ground and propping them or tying them to the trellis, and taking measures to protect them from insects and disease. But it becomes even more interesting when we note that the nation of Israel is often symbolized as "a vine" in the Old Testament. Psalm 80:7-19 pictures Israel as the vine "God brought out of Egypt"; depicting the Father as the gardener, and picturing Israel in a state of judgment and destruction, calling to God to be restored. Isaiah's "Song of the Vineyard", in Chapter 5, verses 1-7 clearly identifies the house of Israel as "the vineyard of the Lord of Hosts", and the "men of Judah as His delightful plant". Once again, Israel is depicted with great optimism and potential, but ultimately judged because of moral and spiritual failure. Moreover, being in Jerusalem during the Festival of Passover, Jesus and His disciples would have observed the unmistakable imagery of the vine when they visited the Temple. I found it interesting that Josephus, the First Century Jewish scholar, wrote of this great golden vine that hung over the entrance to the Jerusalem temple. 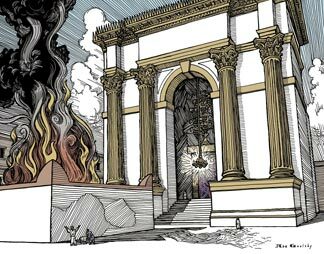 Josephus describes it: “The gate opening into the building was, as I say, completely overlaid with gold, as was the whole wall around it. It had, moreover, above it those golden vines, from which depended grape-clusters as tall as a man." Further evidence in the Old Testament of this imagery can be found in Hosea 10:1-2, where Israel is depicted as "an empty vine"; throughout Ezekiel (Chapters 15, 17, and 19) as a rebellious vine, whose root was plucked up, and fruit devoured; and in Jeremiah 2:21, as a once "choice" or "noble" vine, which has turned into a wild, degenerate, and foreign vine. So, when Jesus refers to Himself as the "true" vine, His meaning would have been unmistakeable to these original hearers. They would have been very familiar with the idea of the house of Israel as the "choicest" or "chosen" vine of God. But they also would have caught a specific use of grammar that escapes our 21st Century understanding. To begin with, He uses the definite article to describe Himself. (The definite article, in grammar, is used to refer to a particular member of a group or class. It may be something that the speaker has already mentioned or it may be something uniquely specified). Thereby, Jesus is saying, "I am the vine, not a vine". Jesus's use of "true" to describe Himself as "the vine" God cares for, is pointing to the nation's failure, but also to the fact of His own good and authentic, genuine relationship with God. Where the nation failed God, Jesus was the complete embodiment of everything they were supposed to be. This same concept is evident in the first chapters of Matthew. There, Matthew describes Jesus' early life and experiences before beginning His ministry as a parallel to Israel's history ... Israel came out of Egypt to the Promised Land; so did Jesus. Israel was tempted for forty years in the wilderness, and failed. Jesus was tempted for forty days, and did not fail. He was clearly proclaiming His Messianic identity. But we cannot fail to understand the rest of this parable of the vine and the vinedresser, and how it pertains to us. While the Old Testament passages I have noted tie the image of the vine to the nation of Israel, Jesus changes the perspective. He doesn't focus on the nation of Israel and what it should have been; on the nation's sins and responsibility. Instead, He shifts the focus to His disciples bearing fruit. He wants to emphasize the relationship Believers have with the Father and the resulting fruitfulness that brings. Thus, His real focus is on the nature of the vine. And since He is the vine, what is His nature? I believe the most concise description that Jesus gives us of His nature, is found in Matthew 28:18 ... All power is given unto me in heaven and in earth. That word "power" is the Greek word exousia and is defined as "in the sense of ability, and privilege; force, capacity, competency, freedom, mastery, superhuman, delegated influence; the power of authority". That is what the Father gave to Jesus, so that He might be endued (empowered) to accomplish His Father's work here on earth. And since we are the branches that are supposed to grow and produce fruit from that vine, what is our nature to be? Jesus tells us in this analogy of the vine ... He abides in us; He and His nature are present in us. We abide in Him; we press into Him until we become His nature. And the result? We bear much fruit! But let us not get too full of pride. He makes it very clear that this exousia power and authority is only available through Him. Apart from Him, we are unable to accomplish anything. But by acknowledging and exercising His nature within us, we have the power and authority to help grow the vine by producing more fruit -- "Go therefore and make disciples of all nations, baptizing them in the name of the Father and of the Son and of the Holy Spirit, teaching them to observe all that I have commanded you. And behold, I am with you always, to the end of the age." We can do that because He is "with us always"; abiding in us. We are the branches that grow from the vine; branches that the Vinedresser nurtures, cares for, and prunes, and protects. We can perpetuate "The Vine" and His nature by demonstrating His nature that is in us -- doing the things He did and accomplishing the works He achieved for the Father's Kingdom. This important passage in the Bible is more than an interesting allegory. It is showing us who we are to be!